On Air Live At The BBC Volume 2 features 37 previously unreleased performances and 23 newly available speech tracks from the Fab Four. Between March 1962 and June 1965, no less than 275 unique musical performances by The Beatles were broadcast by the BBC in the U.K. The group played 88 different songs on national radio — some were recorded many times; others were played just once. 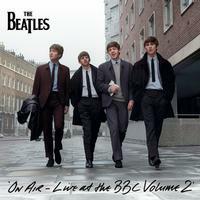 On Air Live, Volume 2 is a new companion to The Beatles first BBC collection. None of the tracks overlap with that earlier release; the 23 speech tracks include in-studio banter and conversation between the band's members and their BBC radio hosts. Ten of the songs on this album were never recorded by the group for EMI in the '60s. Two of those are released for he first time ever: The Beatles' version of the old standard "Beautiful Dreamer" and the group's direct-to-air performance of Chuck Berry's "I'm Talking About You." On Air also features BBC recordings of 30 well-loved songs from The Beatles' catalog, including five No. 1s and other favorites such as: "I Saw Her Standing There." "Twist And Shout," "Do You Want To Know A Secret?" "Boys," "And I Love Her" and more!